Gorgeous White Pulpit Robe with White Velveteen Panels to be worn with distinguished pride and comfort. 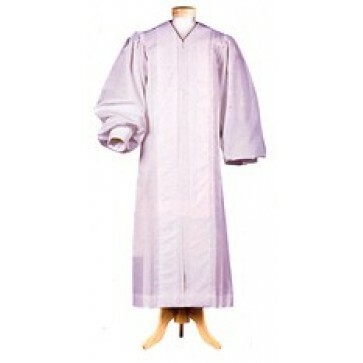 This robe is tailored by expert craft people to standard size. Medium weight Liberty 100% polyester provides for a fine drape yet comfortable in all climates. Majestically adorned with plain yet rich velveteen panels. Matching cording outlines side pleats. Double lined sleeves with cuff for a bell effect sleeve. Full precision fluting across shoulder and back gives beautiful drape.